Why/Why Not presents a speaker caught in quandaries created by changing perspectives, fervors, and locales. Why do we act one way here and another there; why can't a mind stay made up; why do we hate and love at the same time; why does memory fade or insist; why does the ordinary seem so uncanny? These questions are captured in lines that collide and merge, in irreverent and offhand jibes, and in plaintive repetitions. Why/Why Not moves across a vivid terrain—the stage of Hamlet, Phillip Marlowe's Los Angeles, Prague, paintings and gardens—to push through a tangle of ways to make sense of the world. Martha Ronk's poetic language is that of the everyday slightly skewed, as if pieces of an ordinary sentence were missing. 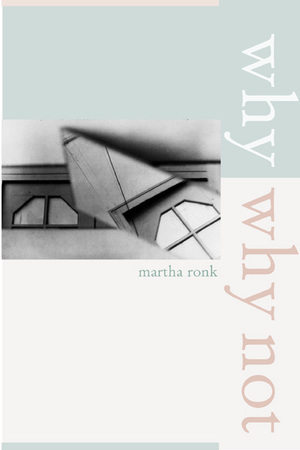 Ronk's poems use the repetitive and the banal to explore ways in which language is intertwined with thought and experience. Martha Ronk is Irma and Jay Price Professor of English at Occidental College. Among her books are Eyetrouble (1998), State of Mind (1995), and Displeasures of the Table (2001).